Sandy Stein…. founder of Finders Key Purse. You worked as a flight attendant before you started your own business. How did you feel about that work, and what prompted you to leave a secure position to become an entrepreneur? I LOVED my job as a flight attendant. I travelled all over, had lots of days off, met and worked with amazing people, and had lots of time for any new opportunity that might come along. I was lucky that I didn’t have to quit “my day job” while I was gearing up for my new career. At forty-three and with a 10-year-old son, the last thing I wanted to do was cold-turkey quit! When it became apparent that I would need to concentrate 100% on my new business (and the money was coming in), that is when I decided to end my flight attendant career that had lasted thirty-five years. Tell me the story of your “Eureka!” moment, when you came up with the idea for the Finders Key Purse. How did that happen? Such a crazy story! Some might find it hard to believe what created my Eureka moment. My husband was no longer working, and I was a part-time flight attendant not making enough money to pay our mortgage. My son Alex was just ten, so I knew I was not going to be able to “wing it” with the money. I prayed to my dad in heaven for some guidance, and that night I had a dream in which my dad described an invention that I should create. When I awoke that morning, I remembered the dream vividly, went to my office, and fashioned a rough prototype of the idea in the dream. It was exactly as I had remembered. I sat down at my kitchen table and thought about what I would call this accessory that finds keys in your purse—Finders Key Purse®! My invention and career were born! You mentioned that when you shared your idea, some people didn’t believe it could succeed. What were some of the discouraging comments and which comments were most difficult to hear and why? I became a stewardess when I was twenty and loved it so much that I decided to forego college. Since I had no college degree nor any formal business education, the consensus was that I could never be a successful business person. I was also told that just one item, no matter how great, could not generate enough sales to make a business successful. The worst comment was from my own husband who laughed at me and asked if I thought that selling a few hundred pieces to my flight attendant friends would be worth the effort to have the product made. I was introduced to few top business men in the gift industry, and each and every one told me how hard it is to be in business and that with the little knowledge that I had, I would never be successful. (Although one offered me $50K for my patent-pending status and name.) 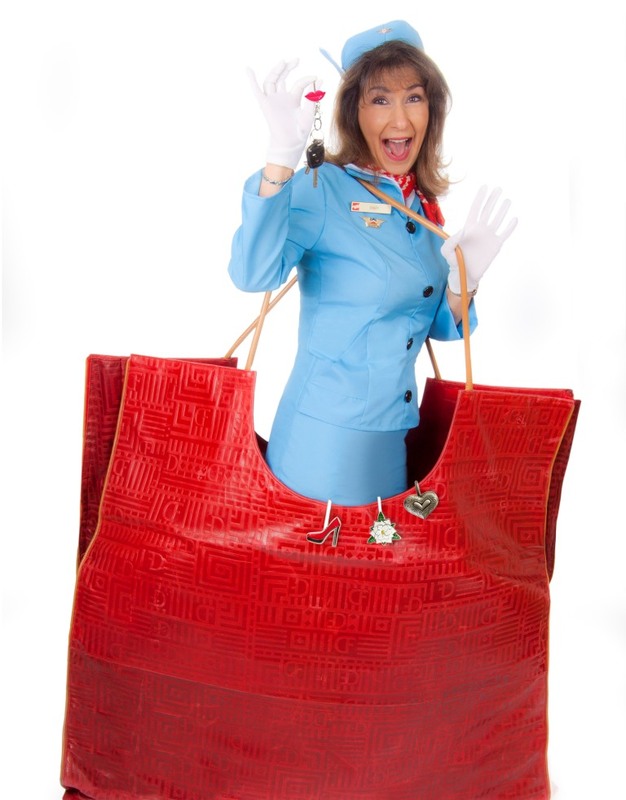 Not only was I “just a flight attendant,” I had “just one item” in my bag of tricks. Luckily for me, I was accustomed to people looking down on my status as a flight attendant, and I didn’t really care what they thought about me or my product. My dad had sent this idea from heaven, my son was counting on me, and I had learned enough about sales and life on an airplane. I WAS GOING TO MAKE IT. What was your process for getting past the naysayers’ discouraging words and moving forward with your idea? It was extremely hard to hear every person talk about what a great little idea I had but offer me no hope of getting it on the market. What those naysayers didn’t know was that I did hear them but didn’t care about their negativity. Even today if I run into people that are more negative than positive, I make sure to stay far away from them. Why in the world would I need to internalize someone else’s fears? I just ignored them and used my creativity to overcome the obstacles that “they” said I would encounter. I created my own sales team from my flight attendant friends with a unique two-tiered sales program that would give them a nice chunk of change when they sold Finders Key Purse® to the stores. Because I didn’t know that I had business parameters, I just did it my way—the same way I ran my airplane: Make my customers happy. We sold 1 million Finders Key Purse® in our first year of business. Success is the best revenge. What was the time frame and what did the transition look like? For instance, did you resign your position first and then begin the business or were you working on both simultaneously for a while? Since I was the breadwinner of the family, I could not just quit my job—especially since I only had to work about 7 days a month and loved my job. After my first year of selling Finders Key Purse® I realized that I needed to be fully present to make sure that everything was running smoothly. The first year was the easiest and the best. Then I realized that I actually had to start learning how to be a business woman and not just pretend I was one. So, with a heavy heart I quit my job in the sky so I could work seven days a week instead of seven days a month. I always knew I wanted to be in business. I even thought that I could do a much better job of running the airlines. (Don’t we all think things like that?) I am so excited and fulfilled that my invention turned into a business. In the past twelve years, I have accomplished so many things and have helped so many people along the way. Though it hasn’t been easy all the time, I realize that I have the tenacity to overcome the ugly things in life. When I look back at how this all happened, it still seems like a dream. I am sixty-six now and have been asked if I am ready to retire. I do have money in the bank and a home that is paid for. Actually, though, my plan is quite the opposite of retiring. My business energizes me, and I am always looking to add new things and find new missions. This has really been my calling, though you would have loved having me as your flight attendant, too. I was one of the fun ones, and my customers almost always had a blast on our flights. I like not knowing what is next on the horizon. Put it in front of me, and I will figure out how to make it happen—that is what I do best.